Shopping for Snow White Film Cells? 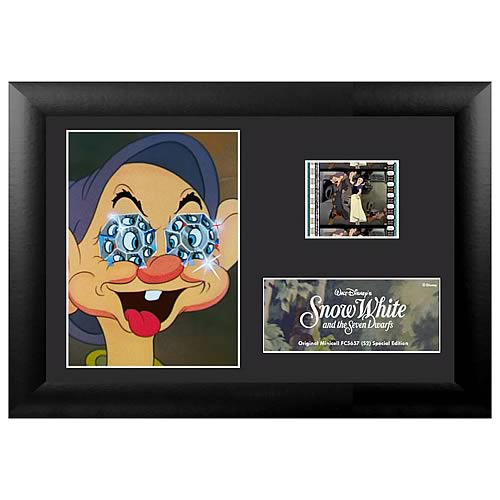 Features a print and an actual cell of film from Snow White and the Seven Dwarfs! This amazing series 2 mini film cell features a print and an actual cell from Walt Disney's masterpiece Snow White and the Seven Dwarfs. Measures 7-inches wide x 5-inches tall. Perfect for displaying in your home or at the office, all the elements are framed in black wood and includes a certificate of authenticity. Order yours today! The beautiful and kindhearted princess Snow White charms every creature in the kingdom except one - her jealous stepmother, the Queen. When the Magic Mirror proclaims Snow White is the fairest one of all, she must flee into the forest, where she befriends the lovable seven dwarfs - Doc, Sneezy, Grumpy, Happy, Bashful, Sleepy and Dopey. But when the Queen tricks Snow White with an enchanted apple, only the magic of true love's kiss can save her!